So far this year, I’ve made $1338.96 consulting on Clarity.fm. This is one the many income streams I’m working on, and it’s an easy one to add to your repertoire. Clarity earnings are incremental; it’s $1300 I wouldn’t have made otherwise. I say that because my “clients” don’t have a pre-existing relationship with me, but this platform brought us together. How to set up YOUR expert profile for success. How to earn your first reviews. My tips and tricks to maximize your earnings. Other Clarity-like platforms you might consider. Clarity is the marketplace to get one-on-one expert advice on a wide variety of business topics. The site makes it easy to facilitate quick Q&A-style consulting calls. 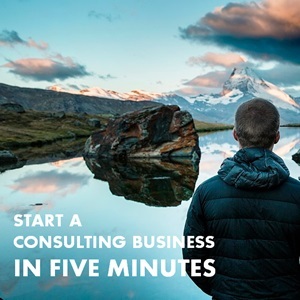 The site was established in 2012 by Dan Martell, and now boasts more than 30,000 experts and facilitates more than 12,000 consulting calls every month. The company, which raised an initial seed round of $1.6 million, was acquired by Fundable earlier this year. You can even talk to “celebrity” entrepreneurs like Eric Ries and Mark Cuban. The Mavericks owner and Shark Tank investor has his rate set to $166.67 per minute though — so far no takers! Consider one of the common themes of Side Hustle Nation: putting your “buy buttons” on marketplaces that already exist. Clarity is one of those marketplaces. People are browsing on there looking for answers to specific questions — and even better, they’re ready and willing to spend some money for help. For service-based businesses and consultants, this is another potential way for clients to discover you; one that doesn’t rely 100% on your own marketing efforts. It’s not passive income, but there’s also very little overhead involved. My average call lasts 20-25 minutes and earns $36.40. How Clarity works is as a facilitator between experts and those needing expert advice. If I’m looking for help with a specific business question, I can go on and browse qualified professionals to set up a call with. It’s one-on-one, direct, and sometimes almost immediate. Rather than spending hours hunting for the right insight or information, I can get the answers I need right away from trusted, verified, and peer-reviewed sources. I fill in a little form to give my expert an idea of what I want to talk about. Estimate how long I think the call will run. Suggest 3 times, beginning as early as an hour from the time I make the request. The company provides a conference call number to dial in to, and tracks how long the call lasts. You pay only for the time both you and the expert are on the line. Once the call is scheduled, you can dial in from anywhere. I’ve taken calls from an Airbnb apartment in Madrid, a Starbucks in Seattle, and while walking around the streets of Anaheim. How does Clarity.fm make money you ask? They take a 15% cut from every completed call. But where this becomes exciting for entrepreneurs and side hustlers is that you can set yourself up on the seller side of the equation. There are two sides to every transaction! If you have a website or blog, you can link to your Clarity profile from your sidebar, your about page, or even in your email signature. 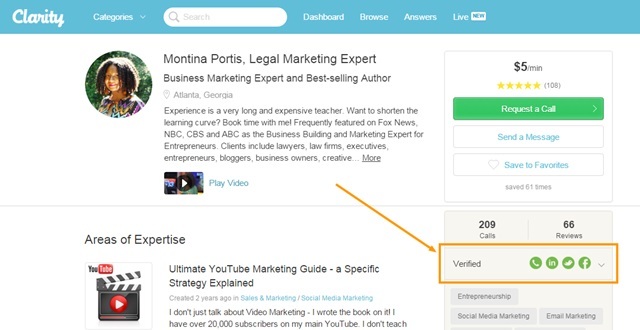 The first you need to do is to create an expert account, which is free. While I can’t be sure, I imagine these verifications will be a “ranking factor” in Clarity’s search algorithm if they’re not already. It’s also a way to safeguard you really are who you say you are — so people like me can’t pretend to be Mark Cuban and charge $167 a minute! Upload a professional picture, or one related to your industry, as long as it shows your face. 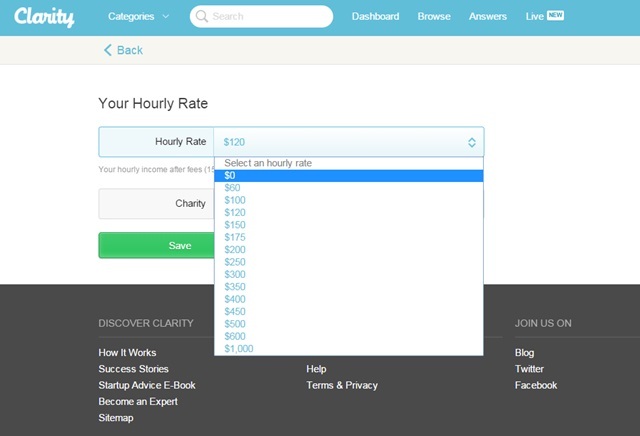 On your public-facing profile page, rates are displayed by-the-minute. This may be a psychological hack. Does a $1.67 a minute sound more affordable than $100 an hour? There are a couple pricing strategies to consider. The first would be to price low initially to help build up a bit of a portfolio of positive feedback. This would also be the strategy to consider if you envision Clarity being a potential lead generation platform for your larger business. Think of it like Costco giving away free samples. They want you to buy the whole pack so they’re willing to give away a taste for free. The other pricing point to consider is if you have publicly listed your rates elsewhere, it might not make sense to “undercut” yourself here on Clarity. After all, if you’re an attorney billing clients at $400 an hour, I’d be upset to learn I could hire you for $100 an hour on Clarity instead. Still stuck? 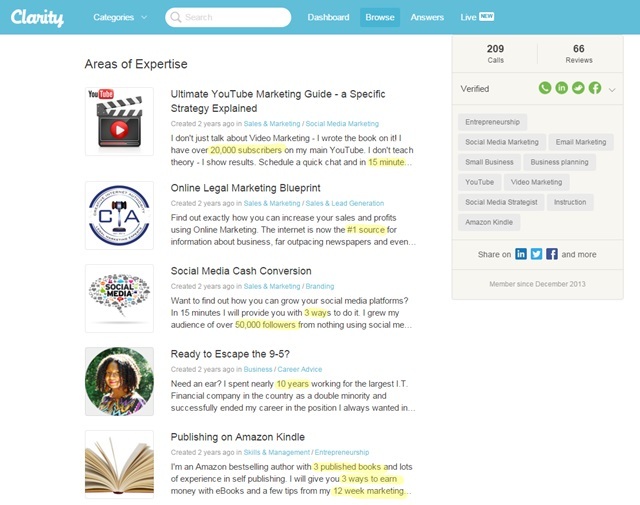 Take a look at what others are charging for your areas of expertise (see below) and pick something in the middle. When I’m shopping I tend to gravitate not toward to the cheapest or most expensive options, but toward something in between. Callers on Clarity may behave similarly. You can change your rate up or down at any time. I started out at $60 an hour and have been slowly increasing my rates as I’ve accumulated more calls and feedback ratings. After you’ve made some money, you can withdraw your earnings to PayPal, or you can elect to donate your Clarity earnings to a charity of your choice. Each expert on Clarity can have up to 5 areas of expertise. Naturally, it makes sense to fill out all 5 to give yourself the best shot of being discovered. You also have the ability to add a picture to illustrate each category you choose and write a little description. I like to have fun with the images, but think of the written description as your online resume. If you have any concrete deliverables or results you can share, all the better. On a page of text, our eyes are drawn to numbers. Since people don’t know you here, they need to know WHY they should trust you to help them. Whenever you start on a new marketplace (Amazon, Udemy, Fiverr, Upwork, Etsy, etc. ), you’re starting from scratch so it’s on you to give your profile the initial push it needs to get some real attention. The best way to collect your initial Clarity reviews is to set up free calls through the platform. 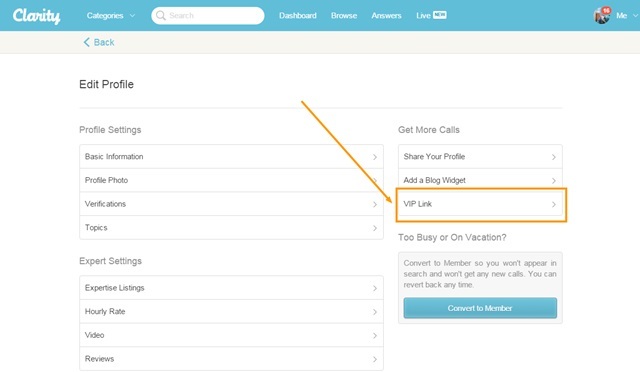 Each expert has the ability to generate a “promo” VIP link you can share with friends, clients, or other trusted individuals. This may not even require a huge change in behavior. If you’re already taking free intro calls with potential clients, why not just run them through Clarity instead for a couple months to build up your base? The call count and reviews are social proof. They help build trust with your potential callers that you’re legit and can help them. 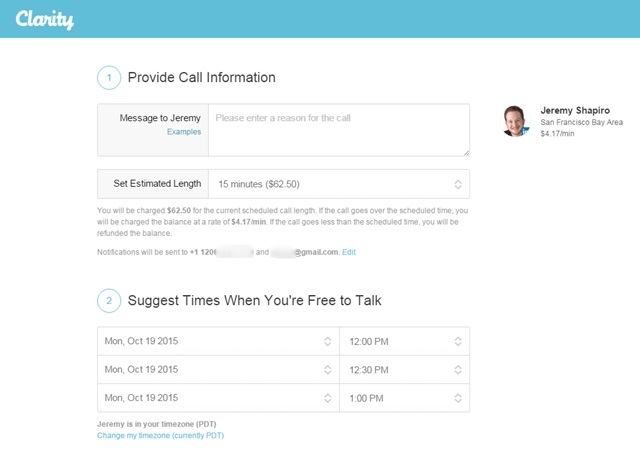 On each call, you can kind of get a feel for the type of customer you’re dealing with. Some are happy with a long rambling conversation, while others have a precise pre-written list of questions they expect you to answer. Some, surprisingly, love to hear themselves talk and will dominate the conversation. I’m an excellent listener when the clock is ticking! It’s generally easier to keep someone talking than to get a new client. Every minute on the call is more money in your pocket. Be helpful and honest, and speak quickly (you’re the expert! ), but also make sure to ask if there’s anything else you can help with. Sometimes a thoughtful (and hopefully insightful) probing question or two can uncover a new area of assistance the caller hadn’t thought of. They’ll be grateful you brought it up – or they’ll politely decline. This is a subtle way of showing you understand and intend to be respectful of their time and wallet. The other thing I like to ask at the end of the call (especially when I know the answer) is: “has this been helpful?” It’s a little sales/psychology hack. You’ll always get a yes, and the more enthusiastic the yes is, the more permission you have to ask for a positive Clarity review. And finally, this is a powerful networking platform. You’ll learn about businesses and industries you might otherwise have never been exposed to. Make an effort to keep the relationships with your callers alive in the weeks and months following your conversation. You never know who else you know who may be able to help them, or who else they know who may be able to use your help. Plus, they’ve already proven their willingness to spend money with you so that’s a good contact in my book. One of the most frustrating parts of Clarity is at the moment their suggested call times don’t integrate with your calendar, so it will occasionally take a few back-and-forth rounds before you find a time that works for both parties. Also, this is a small annoyance, but every time I withdraw my earnings I have to pay the PayPal transaction fee as well. For example, on my last withdrawal PayPal took $16.95 in fees from my $427.01 in earnings. I wouldn’t normally complain, but I don’t see those fees with similar payments from Udemy or Fiverr. Clarity may be the most prominent player in the one-on-one expert advice arena, but there are a handful of alternatives you can try out as well. WizIQ – focused on academic tutoring. Coach.me – focused on personal growth and self-improvement. 24Sessions – business advice for entrepreneurs. SoHelpful.me – [discontinued] offer your assistance for free (for lead gen and market research). Go forth and sell your expertise on Clarity! Have you tried out the platform already? What did you think? Let me know in the comments below if this side hustle sounds doable to you. Interesting! I’ve never heard of this site before. Thanks for sharing your review with us. I love hearing different ways of how to make money online. Blinktoll.com does this way better! Nice article. This to me falls in the freelancing category. Another option is GLG, where I have earned about what you mentioned you have on Clarity. I am registered on Clarity but have not put much time into it. 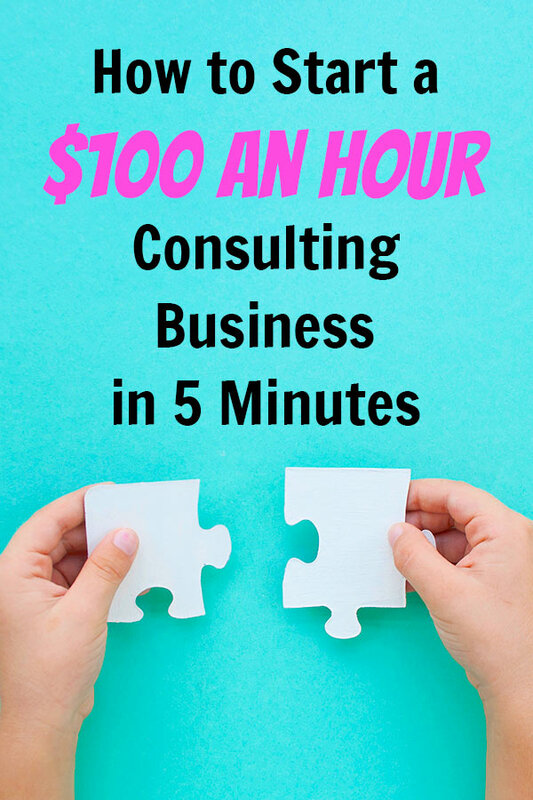 I’ve done similar consulting through eLance, Guru, Upwork (merged eLance) for another few K worth. My only complaint is that I have noticed the % of gigs that actually even get fulfilled is very low. Additionally, those of us in the US are competing against a global market place that is willing to take these gigs for less $. Do you think we will see more knowledge broker type services? You mean the % of gigs on Clarity that go unfulfilled is high? I actually see the majority of people that request a call end up showing up at the agreed-upon time. And so far at least, Clarity seems to be avoiding that race-to-the-bottom on prices. I think their $60/hr minimum helps with that. This is a very awesome post and it’s actually the first time I’m hearing about Clarity.FM. However, we all are looking for means through which we can create a multiple streams of income for ourselves so we don’t have to fully rely on one particular income source in case of any uncertainty and Clarity seems to be a good place for most people to start. From what you wrote about it, it will not only help to put more money into your wallet but, it will also help to position you as an authority in your niche which might end up opening more doors and business relationship for you later. Thanks for letting us know about Clarity Nick, I will take time and look more into it. You bet Theodore, let me know how it goes! Nick – Cool idea. Had never heard of them before, but seems like a great way to get started with Coaching. For me, I have several areas of expertise, but have struggled with which one to target. This may allow me to run a sort of A/B test and gain experience. I am aware of clarity. I have profile too. I’ll have to give Clarity a whirl. Another thanks to you for introducing us to Clarity. This is ideal for my service business, audio/voice narration coaching and consulting. I’ve learned so much over the four years I spent as a professional radio announcer and the past 12 years working as a freelance voice-over talent. I know I have tons of expertise to share for entrepreneurs who want to venture into recording their own audio for podcasts, sales pages, webinars, and emails. Thanks for the great information on using Clarity! I’m another one who has a clarity profile but never figured out how to start from zero. Thanks for cracking the code! Nick! You’ve done it again. This is actually something I’ll be adding to my software development income streams. Thanks for all your podcasts. “Consider one of the common themes of Side Hustle Nation: putting your “buy buttons” on marketplaces that already exist. ” <<<< — this is gold. Why not leverage networks where people you can help are already looking, esp. if it just takes a few minutes? Wonder if there's a post somewhere listing them: Fiverr, Craigslist, Clarity, LinkedIn, I'll bet there are 100+. Hi Nick – thank you, this is fantastic. I’ve never heard of Clarity.fm before but this review has definitely spurred me to check it out. One thing I’m curious about… One of my most valuable business practices is to build an email list. I steer away from any platforms that prohibit me from adding new clients/appointments to my list (why I use SquareSpace over Etsy, and Teachable over Udemy). I just scanned through Clarity’s Terms of Service and couldn’t find anything about this – do you happen to have any additional insight? I’d love to hear your thoughts about list building using a platform like Clarity. 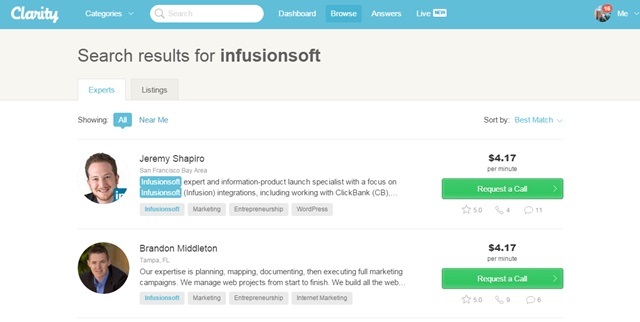 Awesome idea about using sohelpful.me for market research. I am starting from zero and my biggest challenge right now is being able to talk to people. Just set up my profile and my VIP code. Thanks for creating such a detailed post Nick! Enjoyed the article, Nick. I recently registered on Clarity as I know from experience that as a freelance consultant, answering emails or calls from clients without charging can eat up your time and you end up working extra hours to make up for the lost time. We’ve all had the client that makes constant daily calls! I’m going to direct my clients to Clarity to ensure that I get paid for any additional advice. I think the pay-per-minute will please clients too. I’m happy to pay the 15% Clarity fee but didn;t know about the Paypal fee also – that’s a bummer. I found your article from Pinterest! 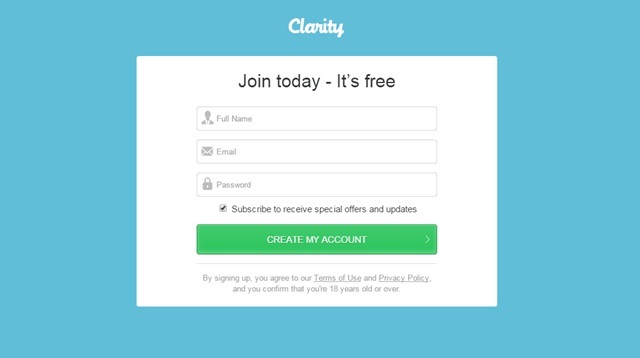 I had signed up for Clarity a long time ago, but forgot about it. Thanks for the helpful tips! you still get clients via clarity ? This sounds great, but their most recent case study is almost 3 years old. My impression is that they are starving, which gives me pause to spend time building a profile to never see impressive results. Are they marketing this service properly or investing in any way to create more awareness? Just curious, as I see some of your dialogue with SHN members is more recent than Clarity. I’m a life coach, changing lives daily. 1 person at a time.